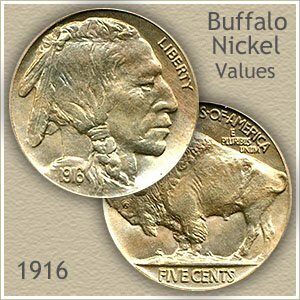 Your 1916 nickel value is part of and continues the run of higher priced early dates. 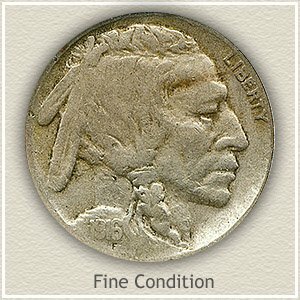 A well circulated 1916 Buffalo nickel is worth $3.63. The beginning years of the series is packed with scarce issues and branch mint coins are the ones leading in value. Production at the Denver and San Francisco mints was far lower than the Philadelphia mint. Branch mint coins, identified by an "S" or "D" are highly valued by collectors, often worth twice the Philadelphia nickel. Any buffalo nickel dated in the teens, with a readable date and either a "D" or "S" mintmark is in demand. 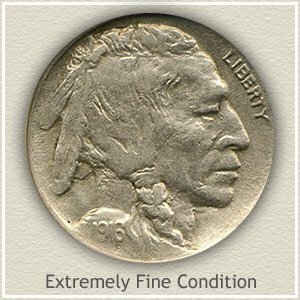 Along with mintmarks and dates, the condition of your old nickel must be considered. Is the coin worn and only part of the date shows, or is it well defined and sharp in appearance? The difference in how much your Buffalo nickel is worth is often surprising. A 1916-S ranges in value from $8 to over $125 and higher depending on condition. The date, the mint that struck the coin, and very important- the condition. This combination uncovers your 1916 nickel value. 1916 nickel value is listed according to the three different mints in four grading categories. 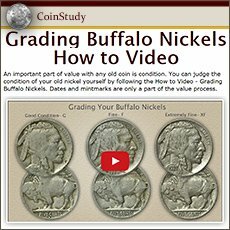 More about grading your coins below. 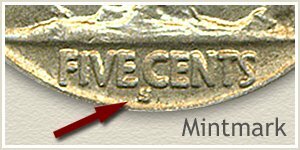 The "D" or "S" in the listing indicates the mint that produced the coin. D - Denver Mint, S - San Francisco Mint, no mintmark for the Philadelphia Mint. Locate the mintmark on the reverse under the Buffalo. 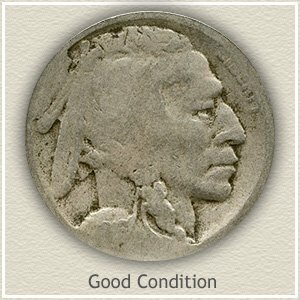 The very popular Buffalo nickel attracts many new collectors to its classic design. A distinctive bold Indian and Buffalo, even in circulated condition is an attractive and respectable collection once completed. Entry into the series is often by way of the affordable, Extremely Fine through Good grades, coins representing nice value. 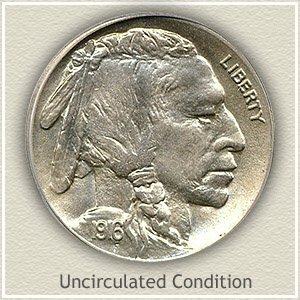 As collectors advance through the series they naturally begin to replace a lesser grade nickel with a higher grade one. As part of the upgrading process a collector develops an eye for quality and refines their search to coins with even, honest wear and original coloring and surfaces. Higher standards rule out many of the available coins. Given this rigorous approach the number of Buffalo nickels available of such a quality is the minority of those still in existence. The challenge, the search, and finding one of these desirable coins is a rewarding accomplishment. Collectors also know these carefully chosen coins are well received in the market place when time to sell. Potential future buyers, either a seasoned dealer or collector is aware of how elusive quality Buffalo nickels are. Your coin is easily one with great collector appeal. Good: Heavy wear depicts the appearance of this 1916 nickel. The tops of the legends on both the obverse and reverse have blended into the rim. Wide areas are lacking detail all across the Buffalo and Indian. The date, one of the highest parts of the coin is faint and no longer bold. Including more relating to your 1916 nickel value. Easily find how much your old coins are worth. Coin Values Discovery... finds the 1916 nickel value and... all old US coin values. It links to all coin series, from Cents to Gold. Value charts, images to judge the all important condition of coins, and a guide to getting the best deal if selling coins.